White Rock is the perfect place for your family vacation or just a weekend getaway. Nestled in the beautiful and tranquil Little Sugar Creek Estates in Blue Ridge, GA, this cabin offers convenient paved access and is located only minutes from the quaint downtown area of Blue Ridge, GA. Here you will find unique shopping, fabulous locally owned eateries, a scenic railway, and all of the natural beauty found in the Georgia Mountains. While you are here, enjoy whitewater rafting on the famed Ocoee River or tubing in the Toccoa River for a more relaxing ride. Also, just minutes away from White Rock, is Mercier’s Orchards, horseback riding, hiking to waterfalls and access to the Appalachian Trail. This tastefully decorated cabin offers all of the luxuries of home and can sleep four comfortably. White Rock has two bedrooms and two baths. The master bedroom is on the upper floor with a queen bed and a Jacuzzi tub in the master bathroom. The basement is equipped with a ping pong table, dart board, flat screen TV. There are two large covered porches for relaxing and enjoying the cool mountain air and enjoy the view. White Rock is within walking distance to Linwood Lodge and Sugar Creek Hideaway. The location of White Rock is absolutely second to none. 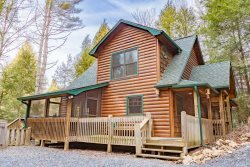 This North Georgia Blue Ridge Mountain Cabin Rental is located only about 5 minutes from Downtown Blue Ridge, GA. The cabin is in a very private area and sites on almost 5 acres of land, providing great privacy and a wonderful sense of seclusion. With this location the cabin is also close to the USFS, Adventure Trail Rides for Horseback Riding, Blue Ridge Canopy Adventures, downtown Blue Ridge for shopping and dining, Ocoee River white water rafting, Toccoa River Tubing, and Lake Blue Ridge. White Rock is very private and is considered a secluded Blue Ridge Cabin Rental. White Rock is within walking distance to Linwood Lodge and Sugar Creek Hideaway. Beautiful cabin, setting and excellent customer service! 2018 was the 4th year we've rented through GMCR, and plan to continue doing so every November. We've always been very happy with the customer service and friendliness of the staff, and the quality and maintenance of the cabins. We've stayed in a different one every year, and it's hard to pick a favorite! We really appreciated the convenience of being very close to town and having paved roads all the way to the driveway. The layout of the cabin is perfectly cozy. The furnishings are a nice mix of cutesy cabin life and a more refined sensibility. Loved the wood burning fireplace and wrap-around porch. The view of the mountain range off in the distance was lovely. The staff was pleasant and the overall experience was great for our while family. We would drop everything to live there.It was perfect for the 5 of us. I felt as if I was in my dream home. Especially since we homeschool. The atmosphere for them is picture perfect. We will be back! We would drop everything to live there.It was perfect for the 5 of us. I felt as if I was in my dream home. Especially since we homeschool. The atmosphere for them is picture perfect. Each member of our family had different favorite features. The fireplace, outdoor hot tub, game room in the basement, ect. The beds are by far more comfortable than most hotels and resorts. The morning view stepping outside the bedroom door to rocking chairs as the sun rises. The loft was perfect for studying. The long steep driveway to arrive. Keeps most regular cars away making it feel more secluded. The quietness and the laundry washer and dryer in the bathroom is awesome. It was a dream home for us. The staff was friendly and knowledgeable. We enjoyed our anniversary together in the peace of those beautiful mountains. We will definitely return. It was a memorable 26th anniversary trip. *THANK YOU* The atmosphere was relaxing and scenic. The cabin was clean and homelike! Very helpful . Cabin as advertised, friendly staff. Nice, very quiet. The bed was very comfortable. Wish I'd looked to see what brand it was. The lady who checked us in was very friendly. As a family needing to get away from the busy city life the location was perfect. It allowed us to relax while exploring activities for entertainment as needed. Beautiful cabin for all ages; great for a family trip. Cabin is well taken care of and cleaned well. The game room and hot tub were a huge hit! This was a wonderful property and you could truly spend your entire stay at the house or travel to nearby stores and restaurants. Everything was Great, wed definitely stay there again!!! My stay here was wonderful. The home is just as described and only a very short drive outside of Blue Ridge. The location is very peaceful in a very well planned community of similar homes. The house was impeccable and very comfortable. Both bedrooms are essentially master bedrooms. My stay here was wonderful. The home is just as described and only a very short drive outside of Blue Ridge. The location is very peaceful in a very well planned community of similar homes. The house was impeccable and very comfortable. Both bedrooms are essentially master bedrooms. Thank you for such a clean and beautiful place to stay. Good location. This is one of the nicest cabin's we have stayed in in Blue Ridge. We loved the location and it was easy to makes reservations. Have already informed just about every co-worker I have what a great cabin we stayed in and the exceptional check-in. You guys are fantastic. Thank you so much. Fantastic cabin, exceptionally beautiful and quiet. We will definitely be staying here again. Staff were friendly upon check-in. Overall, we enjoyed our stay at White Rock. It was a very comfortable cabin and had plenty of room for our family. Very nice, well kept cabin. Great value.